Here is the verdict of the Fans Panel after FC Halifax Town’s 1-0 defeat at Chesterfield on Saturday. Man of the match - I was again impressed with Matt Kosylo. While he’s not always successful with his trickery, he continuously looks to unlock the opposition’s defence, and is by far our most likely player to set up goal chances. 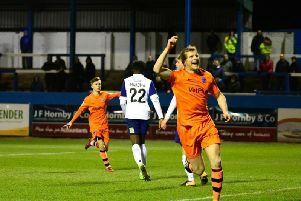 Moment of the match - The 89th minute, and Kosylo sets up the chance for a late equaliser. Quigley heads it wide. I think we managed only a single shot on target, which goes a long way to explaining why we don’t score anywhere near enough. have no idea, but the continuing reluctance to adapt will see us relegated if we’re not careful. Man of the match - Ben Tomlinson: Tomlinson only played the last 15 minutes of the game but provided more excitement in the closing stages than everyone else did put together. He showed some much needed spark and enthusiasm, if only he had started the game or was given more time the result may have been very different. Moment of the match - It has to be the 67th Minute, Matty Brown gave away a penalty to Chesterfield with a clumsy challenge. With the Shaymen’s current scoring record, it was game over from the moment Scott Boden scored. Moan of the match - The team had plenty of corners and free kicks but all were wasted. What do full time footballers do all week if they don’t practice set pieces? Are the players forgetting what they’ve practiced or is it really a game of hit and hope? Man of the match - Matty Kosylo was the only player who looked likely to create anything in a lacklustre attacking performance. No stand out performances at all. Moment of the match - Quigley had a header late on to earn town a point and didn’t come close to hitting the target. We look so unlikely to score in every game and desperately need a quality striker. Moan of the match - Whilst our defence is generally solid we are truly awful going forward. Barely a shot on goal and virtually nothing for their goalkeeper to do. Terrible attacking performance yet again.